Background: Silk Fibroin (SF), a natural source material obtained from Bombyx mori, has been widely enlisted as biomaterial having outstanding mechanical properties. SF has been reported as one of the propitious bio-polymers for various drug delivery systems, as well as drug delivery vehicle. 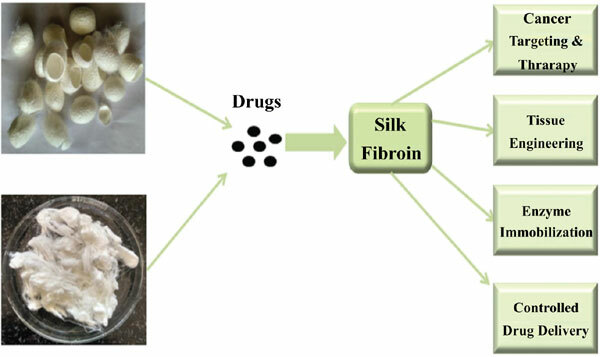 Objective: This review is a summary of comprehensive applications of silk fibroin in various drug delivery systems, and also to present the current opportunities and requirements by furnishing a definitive assessment on silk fibroin as a polymer. Results: SF has been reported as one of the propitious bio-polymers for various drug delivery systems, as well as drug delivery vehicle. SF is inestimable owing to its non-toxic and non-antigenic character, except for the firmness formation whilst being stored at lower temperature. Unlike other polymeric biomaterials, SF is regenerated in aqueous systems in defined temperature, pressure and pH, which is one of its major advantages in formulation. SF nanoparticles are also used to deliver proteins and peptides. Recently, SF has been used to deliver anti-cancer agents like paclitaxel, doxorubicin, floxuridine, and methotrexate, and including the natural product curcumin, has shown to elicit significant biological activity when compared to their conventional form. Interestingly, SF has shown to be a promising biomaterial for implantables and injectable drug delivery applications. Conclusion: In the present review, we have summarized the physical and chemical properties, biocompatibility and non-immunogenic characters of SF and its applications in various drug delivery systems. Biomaterial, silk fibroin, nanoparticles, anti-cancer, drug delivery, bio-polymer.